Control your tongue. 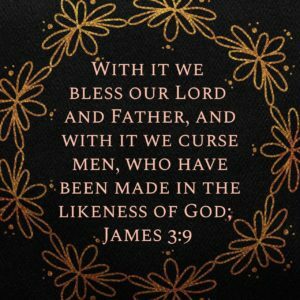 As James continues warning us about the dangers our own tongue can pose, we must be careful with what we say. As we saw yesterday, even though the tongue is small, it is still extremely influential and impactful in our life. Today we see the dual nature as it can say wonderful, helpful things and then in the next breath say horrible hurtful things. Read James 3:6-9. Have we allowed our tongue free reign to say whatever it wants? In one moment it will be praising God and in the next cursing others. Yet we are responsible for the words that come out of our mouths. We choose them and we allow them. Yet, many times they reflect the battle going on inside of us between our sinful nature and our surrender to Christ. How would people judge your Christian walk if your wirds were tge inly evidence they had to use? Do your words reflect Christ…. consistently?